I’ve seen some comments here and there that the Magic Cast-On as it’s shown in Knitty.com leaves a little knot on one side of the toe because you start with a slipknot. I thought that would be an easier way to anchor the yarn to the needle, figuring that when one is learning a new technique it doesn’t help to have to deal with yarn that keeps slipping. As I often do, I over-thought and confused the issue. What I usually do instead of a knot is to loop the yarn around the needle as shown in this picture, with the tail to the left of the working yarn (assuming that you are holding the yarn in your left hand and the needle in your right hand). This “knotless” technique alleviates both the little knot at the side of the toe and the problem some people have had with the slipknot being loose. And, speaking of tension… If you find that you have to tighten up the cast-on loops after you’ve worked a round or two, try making sure that each loop is snug around the needle next to the previously cast-on stitches before making the next loop. The two strands need to twist around each other to make the purl bumps on the under-side. If you make the stitch and don’t snug it up against the other stitches, the twist will be loose and your stitches will be loose. If you find that the loops are too tight, try using larger needles for the cast-on, and then knit off onto smaller needles. 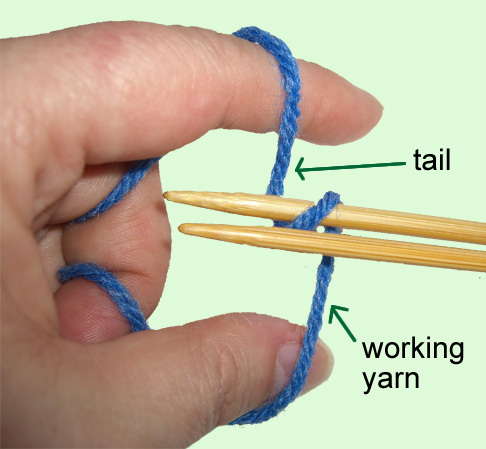 I’m actually very pleased to know that knitters have tried this and found it useful! Please don’t hesitate to ask questions.